Adobe Photoshop Lightroom is an amazing bit of software. I use it for nearly 100 percent of my photo processing needs. From ingesting to converting to cataloging, it’s all done in Lightroom. One of the things I like about Lightroom is that handles all of the RAW files in my archive from Canon D30 (circa 2000) to the 5D Mark II. I even have a couple of Nikon D1 files floating around. My biggest complaint with Lightroom is that it’s a little slow with large catalogs, especially when launching and ingesting and when I’m working on 21megapixel files from the 5D Mark II. After some trial and error, I’ve settled on a couple of very easy steps that make working in Lightroom faster (for me at least, your mileage may vary). 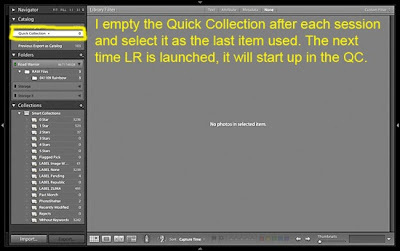 But before I get into specifics there are a couple of things to keep in mind when using LR (or most any image editor). • More RAM is better than less. I run LR on two similar Macs, a 13 inch 2.26 ghzMacBook Pro with 4 gigs of RAM and a 20 inch 2.16 ghz iMac with 2 gigs of RAM. On paper, the little MacBook Pro isn’t much faster than the iMac but with the extra RAM it leaves the iMac in the dust when it comes to Lightroom. 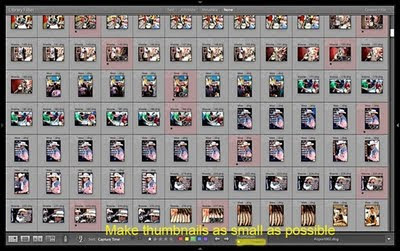 • Dedicate as much of your system as possible to Lightroom. When I sit down to start a serious editing session in Lightroom, I quit Safari, TweetDeck andMail. When I’m done with LR, I quit out of it before restarting Safari, TweetDeck and Mail. This is especially true if you’re working on a RAM impaired (2 gigs or less) computer. Now on to the workflow habits that can speed up your Lightroom experience. 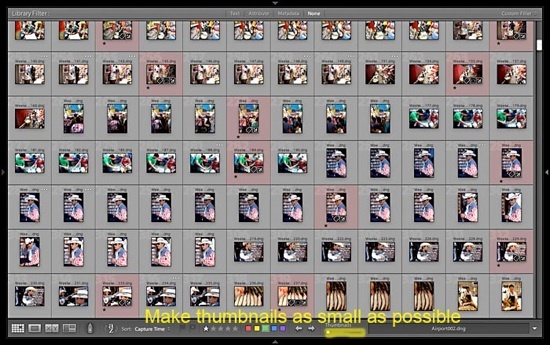 When you launch Lightroom it’s going to load the last folder or collection you used and it’s going to load all of the photos in that folder or collection before it lets you start another session. I’m pretty impatient and for me the most frustrating part of using Lightroom is waiting for thumbnails and previews to build because I can’t start sorting and editing until I can see the photos. Using the fastest cards and card readers you can afford will substantially speed up the import process. I’ve always used SanDisk Ultra II cards, because they were fastest most inexpensive cards available. I recently started using SanDisk Extreme IV UDMA cards with a SanDisk Extreme IV FireWire 800 card reader. The combo flies. I still have to wait for previews to build, but they start building a lot sooner than they did with Ultra II cards and slower card readers. Once I have the photos imported and previews built I go to work sorting, captioning and editing photos. This is where you’ll see the speed gains you made earlier in the process (getting extra RAM and quitting other applications). When it comes to writing captions (every photo in my catalog has a caption), presets can make things go a lot faster. I have a “boilerplate” template for each of several agencies I send photos to. The template has all the information specific to that agency, which saves me typing time. LR also remembers (and auto completes) entries you’ve made on other photos, which speeds up the sorting/editing process. Other than the tips I’ve already listed (extra RAM, quitting others applications), I haven’t found a way to speed up the export/conversion process. This seems to be heavily dependent on processor speed and RAM. Bigger files (i.e. those from a 5D Mark II, D3X or Sony A900) take more time to convert than smaller files (i.e. Canon D30, Canon 1D or Nikon D1). If you have any tips for speeding up export I’d love to hear them. UPDATE AUG 3: On his web site, Lloyd Chambers goes into some detail on why Lightroom is rather pokey on exports and some tips on how to speed it up. He recommends dividing your batch export into two batches and exporting them at the same time. The full explanation is here and worth reading. My photos are available from ZUMA Press or PhotoShelter. My PhotoShelter archive is searchable.